A pool is first and foremost a place to take a refreshing dip. But it’s the surrounding patio and pool house that makes it a space to hang out all day long! 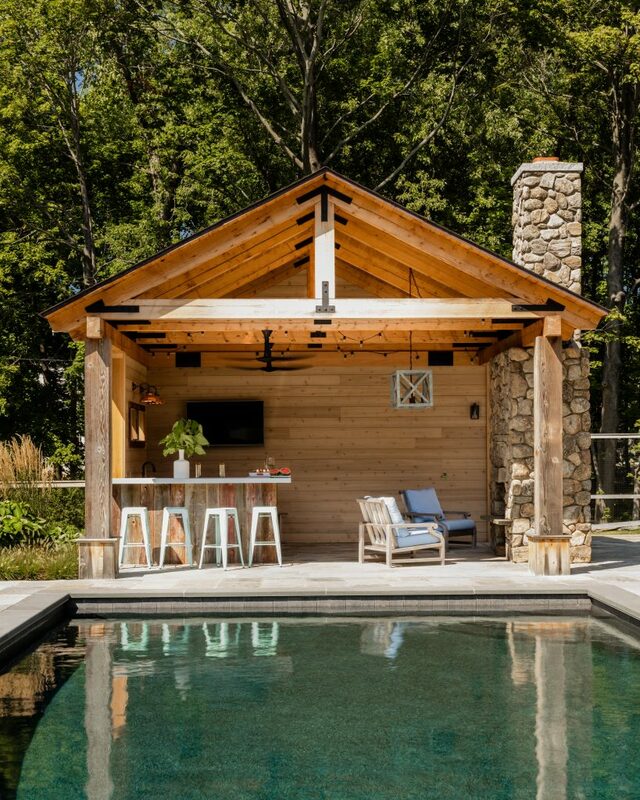 Constructing a thoughtful space to lounge, eat, drink, and play while poolside keeps the good times going (and will make you plenty of friends). This open poolhouse appears quite simple at first glance, but it has a lot to offer. A four seat bar made from reclaimed wood, a flatscreen TV, and a natural stone fireplace make this the type of space where you could easily lounge the day away. The owners of this home are a young family who wanted a space to fit their active lifestyle and entertain plenty of guests. This pool and sprawling patio certainly deliver! For those who love leisure, several lounge chairs and a hot tub offer numerous spots to kick back. Closer to the main house, an outdoor fireplace and seating area creates a living room-esque space to socialize. While the adults lounge away, the kids have plenty of space to play. 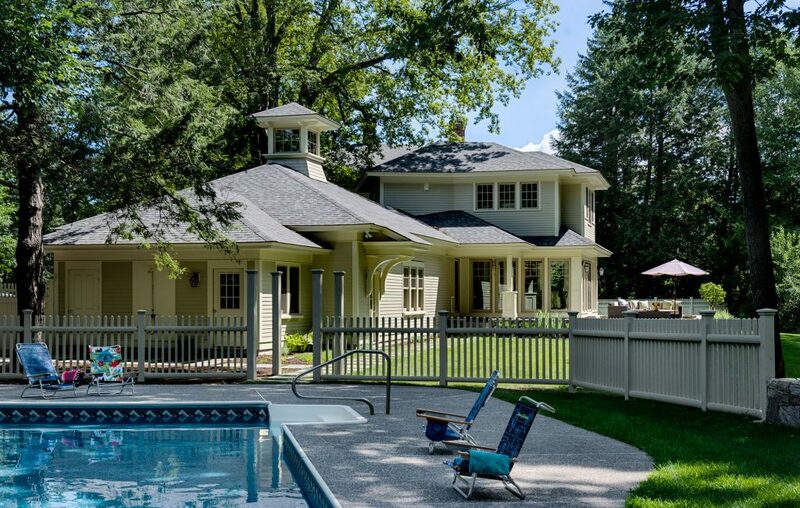 This pool house contains a three story climbing wall and a den with a flat screen TV. In an adjacent mini-kitchen, guests can take a break from the heat with some refreshments. We recently renovated this stunning Victorian-era, oceanside home in North Hampton, NH. 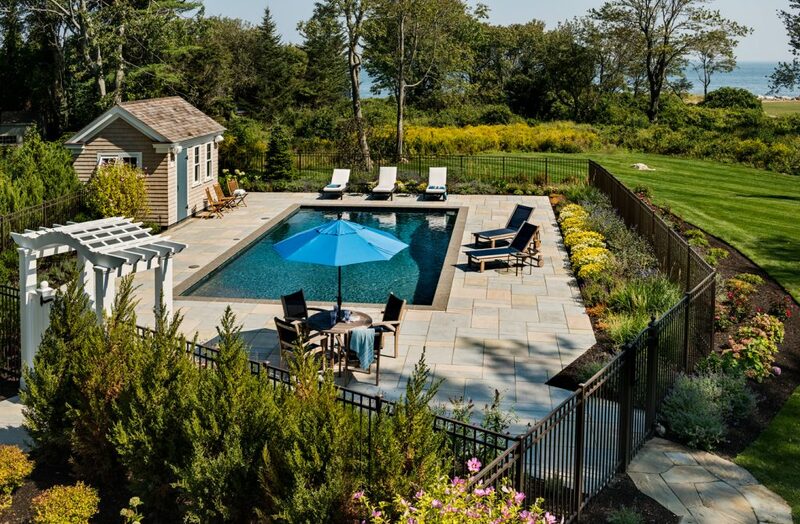 An in-ground pool and hot tub are among the home’s many spectacular features. We took great care to integrate the patio with native plantings and stone walls, allowing the space to blend seamlessly with its beautiful surroundings. Set in the middle of a New England apple orchard, this home is surrounded by idyllic beauty. The pool is nestled close to the house, and is made complete with a built in hot tub. Altogether, it creates a relaxing — nearly spa-like — experience. When these homeowners acquired this plot of land, preserving its natural elements was a priority. With that in mind, the home and outdoor spaces were designed around several mature trees. Between the lush greenery and a view of the Atlantic ocean in the distance, it didn’t take much to make this pool area beautiful. Family was the focus for this home addition. 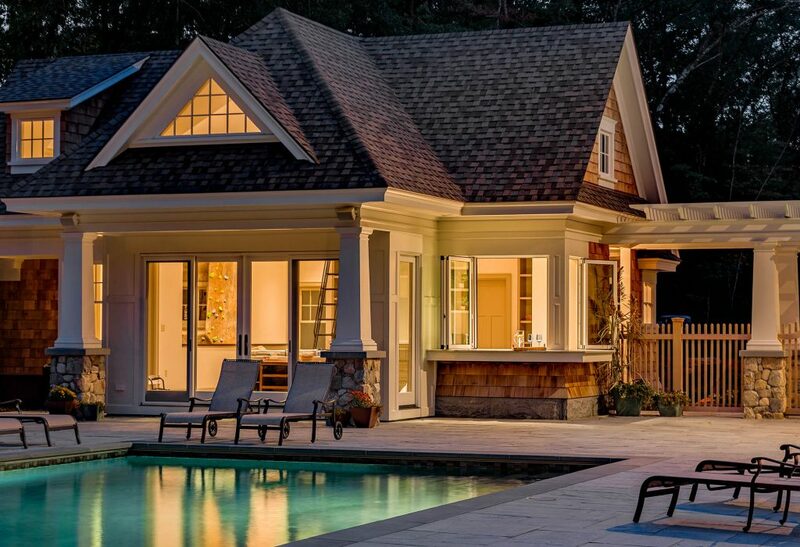 A combined garage and pool house was added to connect the main house to the backyard pool and patio. This allowed for direct access and easier supervision from the house. This active family wanted poolside fun all year round! In the summer, large French doors open wide to a patio and backyard. In the colder months, this space is fully insulated to keep the good times going. A flat screen TV, fireplace, and bench seating with window access to the kitchen make it easy to hang by the pool anytime. Though this summer is coming to an end soon, there’s no time like the present to begin planning next year’s fun. 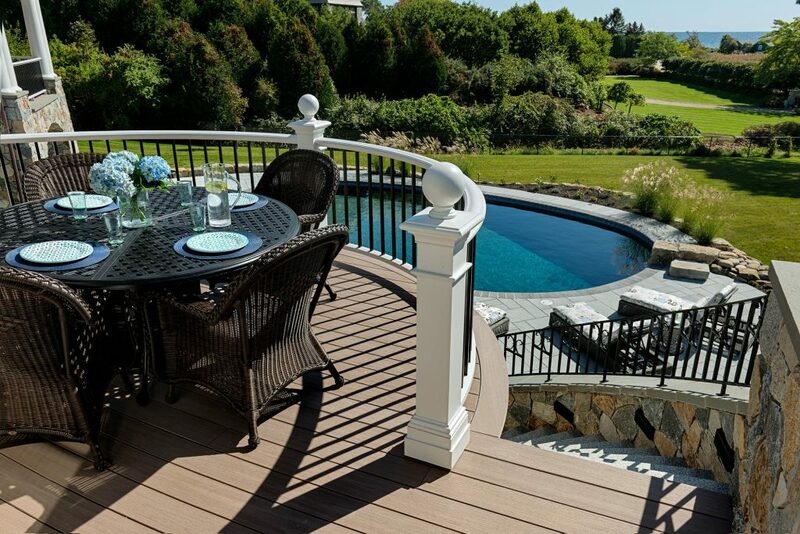 If you’d like to add a luxurious pool to your home, contact us to get the conversation started.